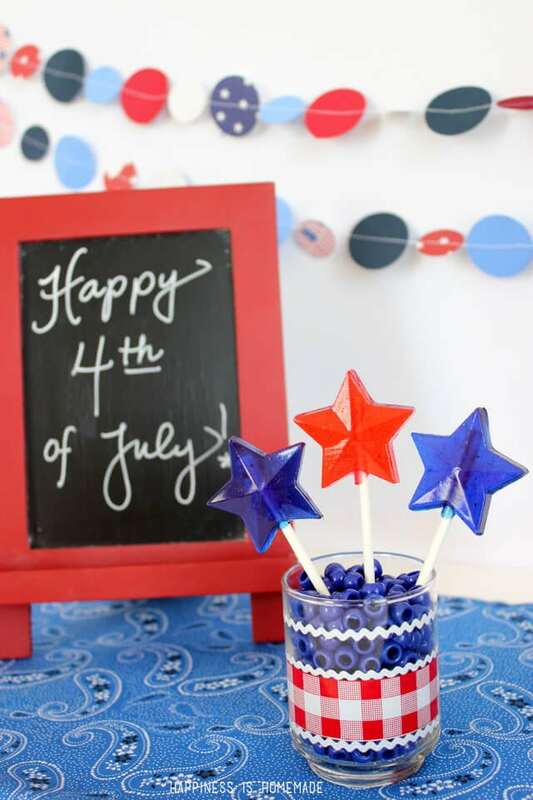 We love the Fourth of July around here – block parties, fireworks, BBQs, parades, American history, flags, freedom and all things red, white and blue. When I was younger I always thought that I was the only one who had such a heartfelt fondness for the holiday, but as I got older I discovered more and more people who shared my love. 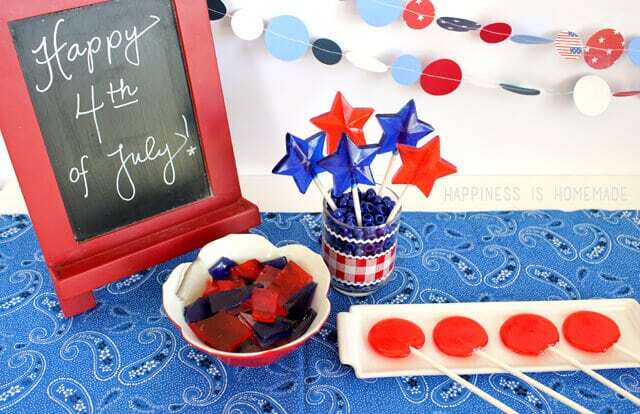 I am super excited to have teamed up with over 100 top bloggers to bring you the ULTIMATE red, white and blue ideas and inspiration round up! 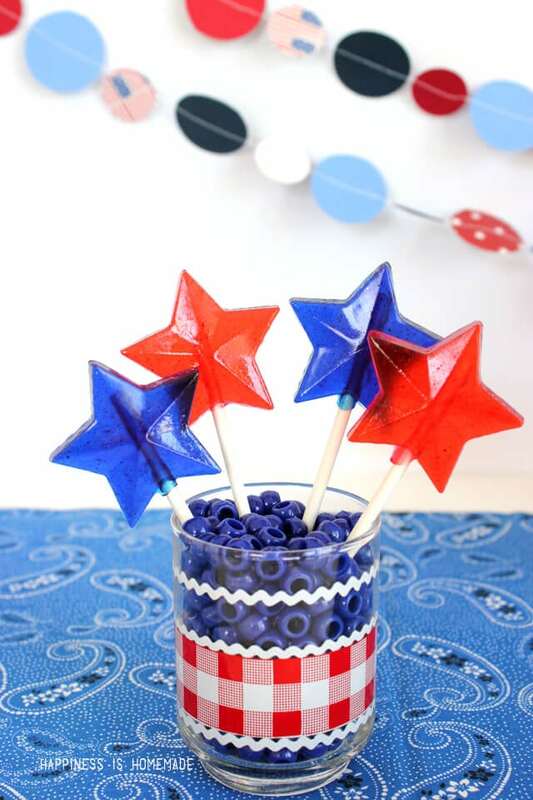 I’m sharing a delicious DIY holiday treat idea here with you today, and be sure to scroll all the way to the bottom of this post for TONS more amazing patriotic ideas! 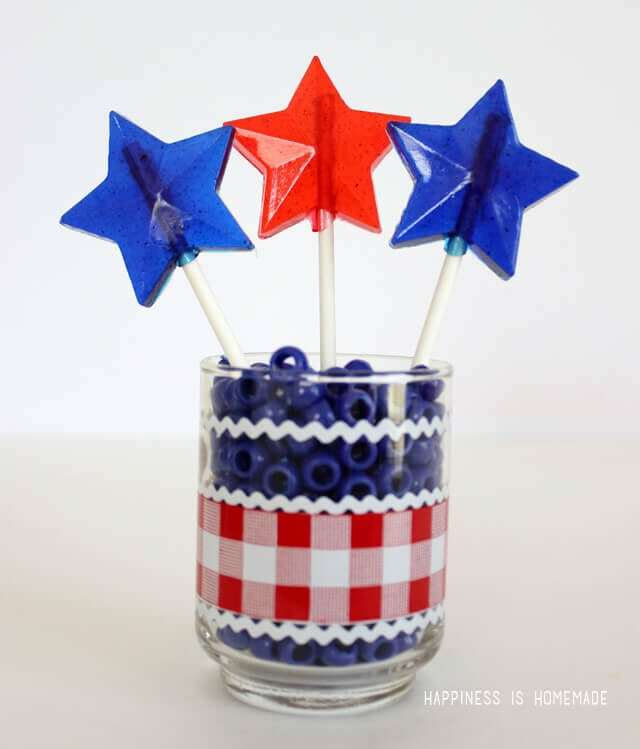 Every year for the Fourth of July I make a new dessert or treat for my family – this year I made my own DIY red, white and blue hard candy and patriotic star shaped lollipops. They were a HUGE hit! 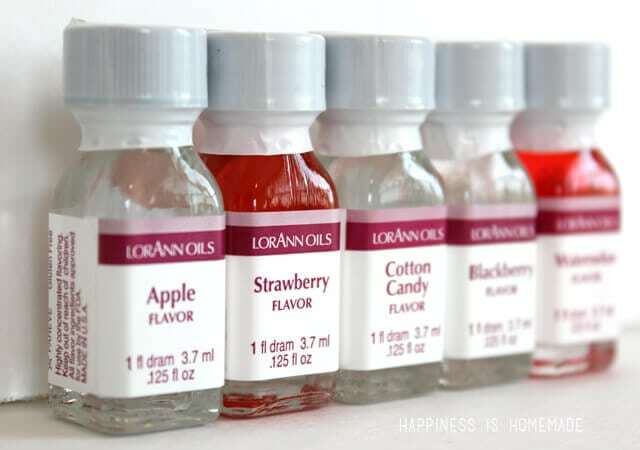 The flavoring oils come in these tiny .125 oz drams, and there are TONS of flavor choices available . 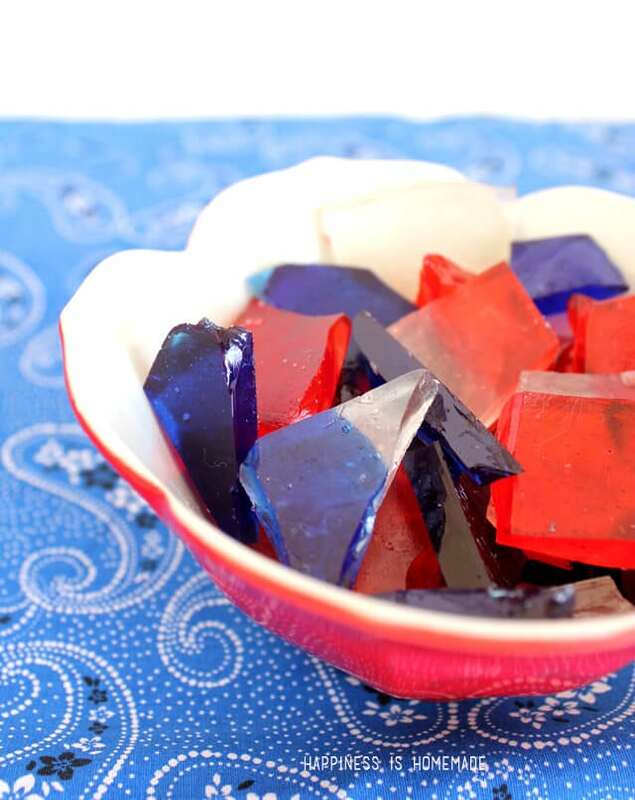 I used about a dram and a half for my batch of candy, and the flavor was quite strong without being overwhelming – a little bit goes a long way! If you want to be a prankster, mix and match the colors and the flavors. No one will expect their blue lollipop to be apple flavored or their red lollipop to taste like lemon! To make the candy I followed the step-by-step directions and recipe from Chica and Jo. 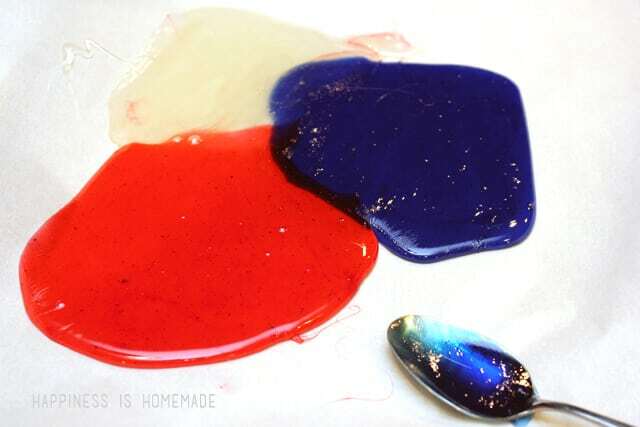 They have an awesome hard candy tutorial with loads of photos and troubleshooting tips that are great for beginning candy makers. When they tell you that you’ll only have about 5-6 minutes to pour the melted sugar, listen up! It’s likely going to feel like the fastest 5-6 minutes ever! 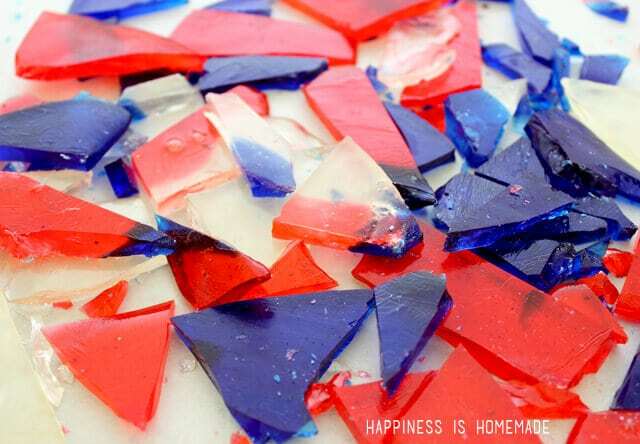 The liquid sugar cools very quickly, so work rapidly, but be VERY careful! 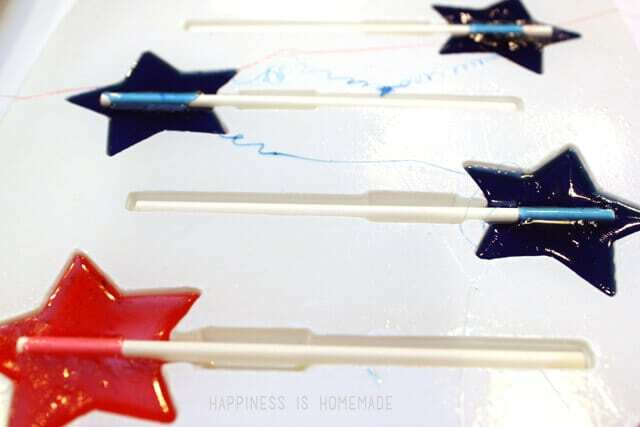 When pouring the sugar into the molds, try to minimize the amount of dripping or stringing between the lollipops, and be sure not to overflow your molds. The candy sets up in about 5 minutes and will be easy to remove from the molds. 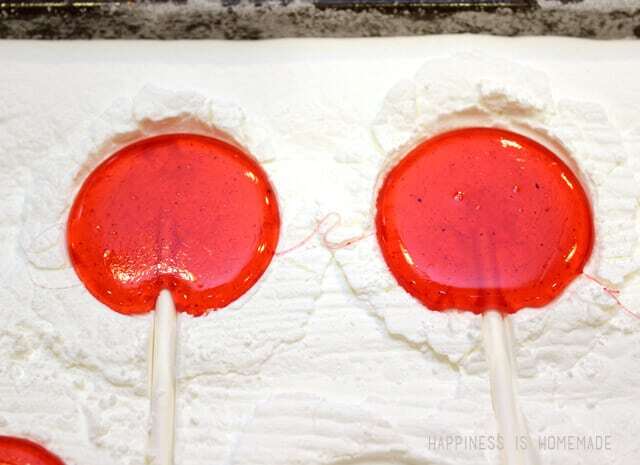 Round lollipops molds can be made by filling a shallow baking tray with cornstarch and creating small circular indentations (I used a large bottle top) in the cornstarch and pouring the melted sugar into the divot. As my sugar mixture started to thicken up to the point where I couldn’t pour it in the molds anymore, I used a spatula to dump the remaining hot sugar on to a parchment lined baking tray. I allowed the different colors and flavors to mingle together and cool. 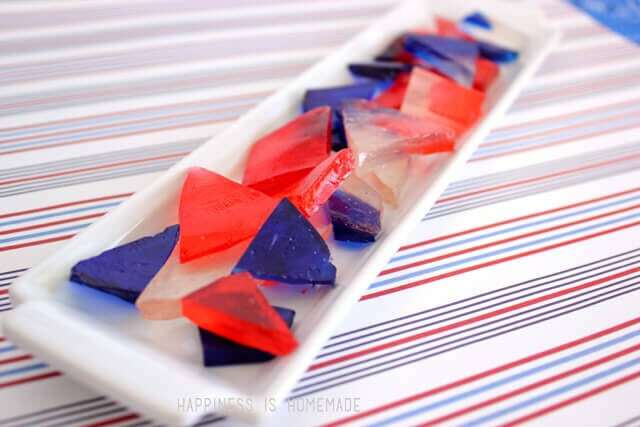 Once cooled the sheet of candy can be broken into hard candy “glass” (which actually isn’t nearly as sharp as it sounds or looks!). YUM! Thanks so much to Abbey of The Cards We Drew for organizing this talented group of ladies and compiling all of their amazing ideas!